DraftKings Promo Code Bonus $3 Free! DraftKings specializes in daily fantasy sports and is expected to dole out more than $1 billion in prizes in 2017. During the last football season, the company awarded a cool million to more than a dozen players. It features an unmatched selection of games across many different leagues, including the NFL, MLB, NHL, NBA, UFC and NASCAR. Click here to play at the #1 most popular fantasy sports site in the world! Requrements Open a new account and deposit $5. That's it! More Free Contests Earn Frequent Player Points and gain entries to more free contests! DraftKings is the largest fantasy sports provider online. It emphasizes one-day contests, which means that you win fast and can move on quickly from disappointments. With traditional fantasy sports, an injury can haunt you all season, but that isn’t an issue with daily games. There are contests with lengths longer than a day for those who prefer it, and DraftKings does a great job of ensuring that there are paid options for all budgets. You can play cash games every day for a month and spend as little as $3. Creating an account at DraftKings is simple and doesn’t require a deposit or any banking information. All you need is a valid email address and to create a username. There are contests to participate in that have a $0 entry fee. You can even win real cash prizes from these. There’s usually at least one free contest a week, and there are often more based on which sports are active at the time. 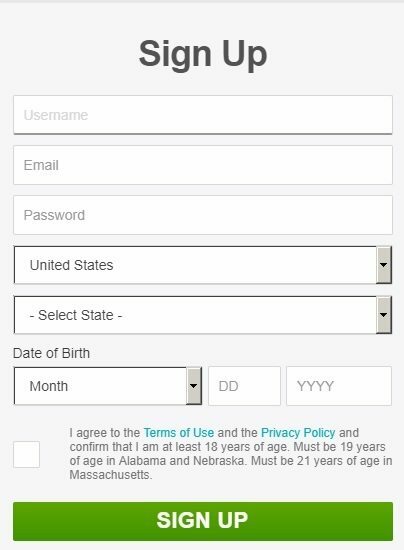 Just click on our link, press “Sign up” in the top-right of your browser, and complete the form that appears. When you’re finished, you’ll have a brand-new DraftKings account ready to go. There’s certainly a lot more to do at DraftKings if you have money to wager, and there are 10-cent and 25-cent contests, so you don’t have to spend a lot to have fun and win cash prizes. 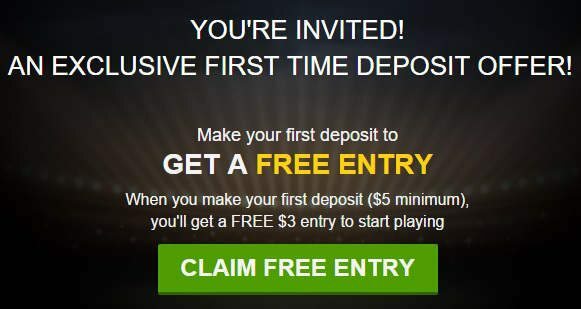 The minimum deposit is $5, and that first deposit also nets you a free ticket. The free ticket is worth $3, and it doesn’t require a promo code. DraftKings will credit it to your account as soon as your deposit clears. The bonus ticket must be used within a year and is good for any $3 contest, which can pay out up to $30K. Once your account has been credited with the free $3 contest entry, which you can verify in the “My Tickets” section of your account page, you’ll have to put it to use on a matching contest. Within “My Tickets,” click Redeem to see what contests your ticket is good for. Then find the appropriate contest in the lobby, enter it, and start drafting. When you’re done, click the “Enter” button on the bottom-right. As long as you’ve chosen to enter a contest for which your ticket is valid, it will be used up, and you won’t have to spend any of the money in your balance. 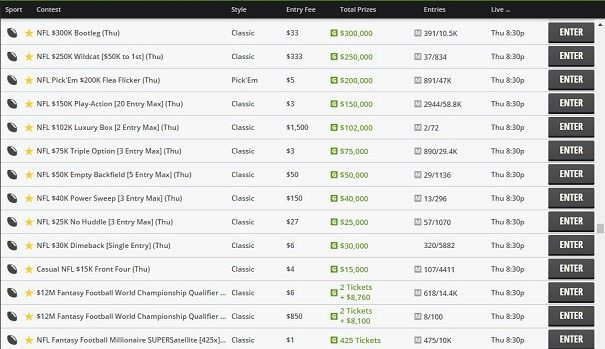 The free $3 ticket is just the start of what you can look forward to at DraftKings. The company has deployed a full roster of promotional offers to reward you not just for registering but for all your play going forward as well. 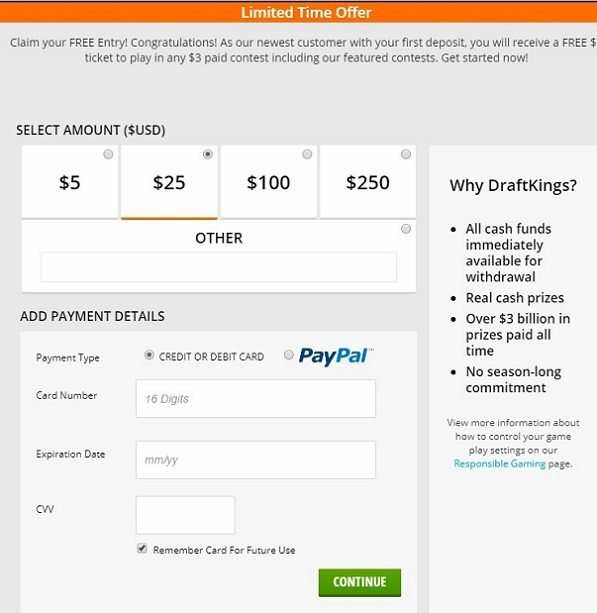 Whenever you enter a paid contest at DraftKings, you’ll earn Frequent Player Points (FPPs). For each $1 you pay in entry fees, you’ll earn one FPP. You can receive more FPPs by completing the daily Missions. Each mission involves completing a simple task, like playing in any contest, and comes with the stated FPP reward. You can view the current day’s mission by selecting “Missions” from the top menu while logged into your accout. FPPs are the cornerstone to several of the lucrative promos at DraftKings, which we’ll explain below. 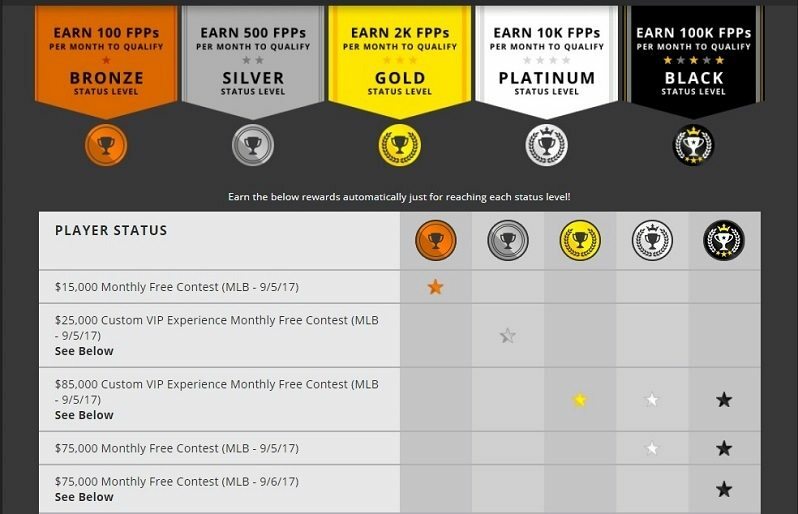 Based upon your FPP total during a month, you’ll qualify for the appropriate Player Status level at DraftKings. There are five tiers (Bronze, Silver, Gold, Platinum and Black), and you’ll receive a free contest entry or multiple entries at the end of each month depending on how high you were able to climb in the ranks during that month. The contests earned through the Player Rewards scheme during a particular month take place early the next month. See below a breakdown of the various levels, the FPPs required, and the complimentary contests that each tier can participate in. Every month, there are two Custom VIP Experience contests. One of them is open to those at Silver level while the other is for Gold+ members. The winner of the Silver competition and the top two players in the Gold event get to craft their own personalized VIP sports experiences. This can involve tickets to live games, travel, hotel stays and exclusive access to the players. If you win such an experience, all the details will be arranged between yourself and a DraftKings concierge, so really, you can turn whatever sports-related dream you have into reality (within reason). 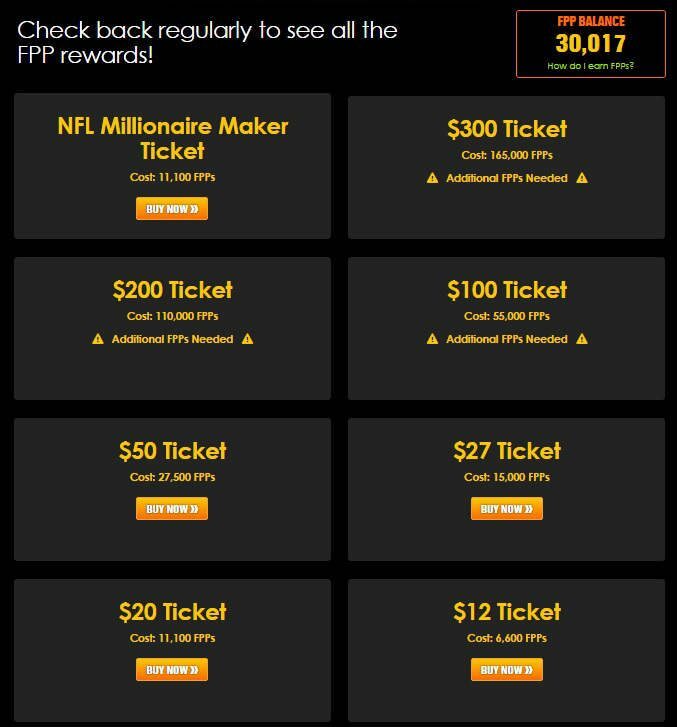 Within the DraftKings store, you can exchange your FPPs for tickets to contests. The smallest exchange option is a $0.25 ticket for 150 FPPs, but there are plenty of larger tickets present, going all the way up to a $1,060 ticket for 583,000 FPPs. From time to time, there’s also merchandise and other goodies waiting to be claimed in the store. 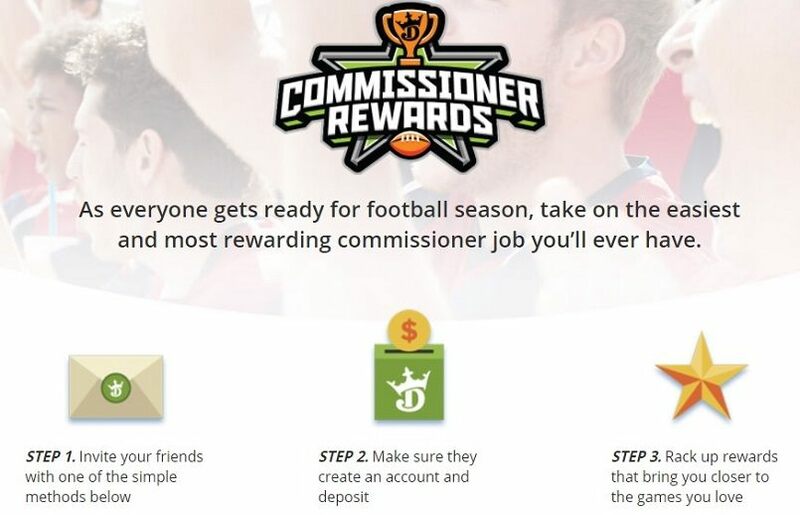 The referral program at DraftKings, also called Commissioner Rewards, is a way for you to tell your friends about this excellent site and get free stuff at the same time. For every person who creates a DK account through your personalized link and deposits at least $5, you’ll get a credit equal to 25% of their deposit amount. The maximum amount you can earn from a single friend’s deposit is $25, and there’s a cap of $1,000 on total earnings from this program. The sums you receive from Commissioner Rewards aren’t straight cash. Instead, you will be paid in DraftKings dollars. This is a spendable currency that you can only use to enter contests on the site. Any winnings you should earn through these contests will be paid out in real money as usual. If you’re able to sign up a certain number of players, you’ll get to enjoy additional rewards. These might include contest entries and DraftKings-branded apparel. Grab your free $3 entry and the other cash that DraftKings’ promos provide. The cashier interface at DraftKings is pretty straightforward. You can select one of the listed values to deposit that amount, or choose “other” to enter in your deposit value manually. DraftKings accepts payments from major credit cards and PayPal. You can add as much as $2,000 to your balance at a time, and it’s possible to get even this generous maximum raised higher by submitting certain documents to the company. The minimum deposit is $5, which means that every deposit qualifies for the free contest entry that we’ve discussed above. 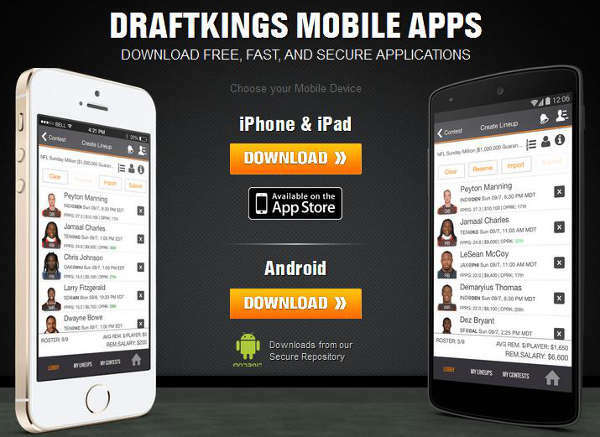 The DraftKings software is accessible on the web rather than through a desktop download application. This means that you can choose the events to enter, draft your teams, and follow your progress wherever you are and almost no matter what system you’re using. The lobby has several convenient filters, and the drafting screen is clear and easy to understand. Following your performance is a piece of cake with the Gamecenter screen, which displays updated standing and points totals in real time as the results come in from the sporting competitions underway. While you can use the regular DraftKings website from your mobile, there are a couple of dedicated apps for iOS and Android that are quicker and more mobile-friendly. The screens that you’ll be browsing through with your phone or tablet have been optimized for the smaller display sizes, so a lot of the clutter has been removed. What hasn’t been taken away is the outstanding functionality of the normal DraftKings site. The cashier is supported too, so you can make your deposits and withdrawals while on the go. Private: Only the people you specify can enter one of these contests. 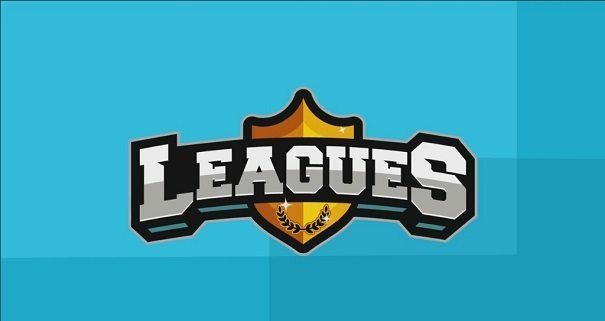 Become the commissioner of your own League at DraftKings. Invite your friends for a season-long battle. Unlike regular long-term fantasy competitions, this one consists of new lineups and a new contest every week rather than forcing you to stick with the same players for months. You can create recurring contests that will automatically appear at periodic times so that you don’t have to manually enter all the details by hand on each occasion. With hundreds of options for what to play at any given time, it’s certainly possible to be overwhelmed by the selection at DraftKings. There are a number of them that tend to draw in more players than others, so they might be a good choice if you’re uncertain as to what to play. In this free-to-enter contest, there’s $100,000 at stake. However, there’s also the possibility of a $1,000,000,000 prize if you happen to choose the lineup that scores the most points out of all possible valid lineup combinations. You might be wondering how DraftKings can afford this. Well, the firm has obtained insurance for the event, so if someone wins, DraftKings won’t have to eat the entire $1 billion owed itself. 200 lucky souls will get an all-expenses paid trip to Miami to attempt to grab a slice of the $12,000,000 that’s up for grabs in the Fantasy Football World Championship. Everyone who attends will take home at least $12,200, and the first-place winner will score $2,000,000. In order to participate, you must win your package in one of the qualifiers that DraftKings is running. 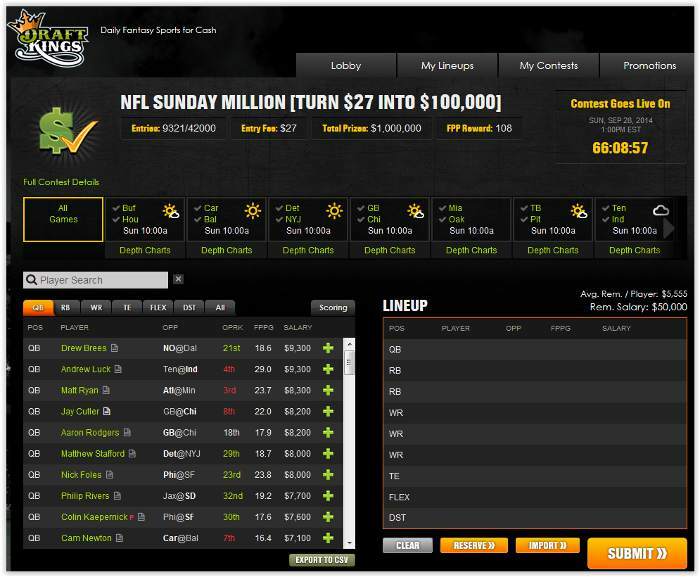 There’s $2,000,000 in prizes for the weekly Play Action NFL tournament at DraftKings. First place is worth $200K, but all positions down to 192,650th will win something. The best part about it is that it costs only $3 to enter, which means that you can use the free ticket that you get for depositing to join this contest without paying any money. If you love fantasy sports, you’ll appreciate the quick-hit experience that DraftKings delivers. The free contests, the low-roller contests and the tickets purchasable with FPPs ensure that you’re playing every day regardless of how big your bankroll is. Fantasy sports are also completely legal in most states, so U.S. players don’t have the same worries that are often prevalent when placing sports bets online. 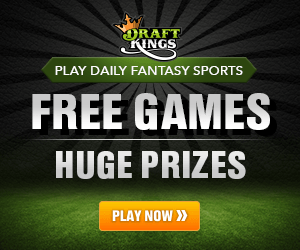 Create your account at DraftKings and make a deposit to receive a free $3 contest entry. Read another review of the DraftKings promo code here. Find additional DraftKings promo codes at DraftDuel.